Elvisbooks for children and grownups too! In Portugal, a children's book about Elvis titled "Elvis - O Rei Do Rock" (means king of rock, would be my guess) is to be released in September. I think that's great, you can never be too young to learn about Elvis, right? That's why I bought a CD copy of "Elvis Sings For Children And Grownups Too!" to my sisters first child six years ago. Unfortunately, it seems like he and Elvis didn't quite hit it off, and the CD is pretty much standing on its shelf unplayed. Perhaps I should have kept it myself, it isn't that easy to find nowadays. Anyway, there are other things about Elvis you can give to small children, and perhaps I would’ve had greater luck if the Swedish children's picture book "Pek-Elvis" (Pek means point in Swedish) would have been out six years ago. "Pek-Elvis" was released in May this year and it's really a great little book with 20 pictures of things associated with Elvis. For example, the Swedish word for house is illustrated with a drawing of Graceland and the word for ring with a TCB-ring. 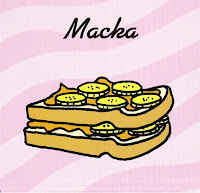 A pink Cadillac accompanies the word for car and a peanut-butter banana sandwich the word for, obviously, a sandwich. There is also, among others, a guitar, a microphone and of course, Elvis himself. The only word I missed was sideburns, but I guess the author can be forgiven, for this is really a cool book for the youngest. And maybe for the not so young also, because I really enjoyed looking through it. Why Elvis Presley Enterprises haven’t thought this one out yet is anybody's guess. By the way, this is the second children's picture book by the author, the first he did was a picture book about the bible. That tells you something about how big Elvis still is, don't you think? Where did the scarves go? 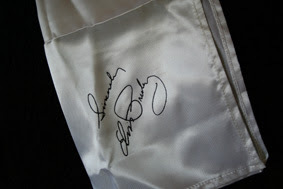 As Lisa Marie enters the Graceland Archives during an interview with ABCs "Good Morning America", she discovers a scarf that Elvis dedicated to her. "My God, I've never seen that," she said when she saw the scarf. "I want it. Can I take it? I'm going to get it framed." The strange thing is, as ElvisNews.com points out, that the scarf is in the book "Elvis by the Presleys". I just checked my copy and it’s true, right there on page 173 is a picture of the scarf. Does that mean that she never read the book she was part of writing? Makes you wonder, doesn't it? Speaking of scarves, Elvis must have thrown out tens of thousands of them to fans in the audiences during the 70's. In the movie "This is Elvis" you can watch him give away ten scarves (I counted!) during the song "Love Me" from June 1977. Charlie Hodge is following him around the stage with a bunch of scarves in his hands, and on the piano you can clearly see a whole supply of white, red and blue scarves. Where are those scarves now? Well, maybe many fans did what Lisa Marie talked about, got them framed and hung them on the wall. Another part of the answer is found by making a search on Ebay that reveals you can bid on a piece of a scarf. Seems the idea is to hack up a scarf in 150 pieces or so and then have every piece framed together with a photo from that particularly concert where the scarf was thrown by Elvis. I found pieces you could bid on from both his last Memphis concert on July 5, 1976 and from a concert at Nassau Coliseum on June 24, 1973. But wait! There is also a silk scarf you can bid on that according to the seller was purchased at a concert on March 21, 1976, with a stamped signature on it. I have one just like this that I bought through a fan club sometime during the 80's (see picture above). Maybe I should have it framed! 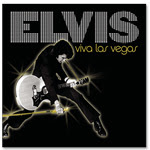 Today I ordered the new "Viva Las Vegas" double CD. Not because of the first disc which is a compilation of already released songs from Las Vegas in 1970 and 1972 that kicks off a bit far fetched with the title track from 1963. This certainly isn't the first concert that has been released from 1969 in recent years. We already got one on the "Live In Las Vegas" box set (from August 24), then the FTD-releases "Elvis At The International (August 23)" and "All Shook Up (August 26)", the latter which included the famous laughing version of "Are You Lonesome Tonight". But from the day I heard the "Elvis In Person" record for the first time when I was a kid I have always enjoyed the live recordings with Elvis from 1969. He’s so full of energy, sings fantastic with much of that raw 68-voice still present and clowns around quite a bit (maybe too much at times). Even the old songs sound great, like "Blue Suede Shoes" and "Hound Dog". And the monologue is always funny to listen to ("I did loving you, loving her and loving everybody I could get my hands on at the time", for example). So even with the wealth of material already released from August 1969, I look forward to the arrival of "Viva Las Vegas". Disc two, that is! I'm now the proud owner of a Harold Robbins book. Never heard of him? Me neither. But the title is well known to me, and I immediately recognized it in the second-hand bookshop. 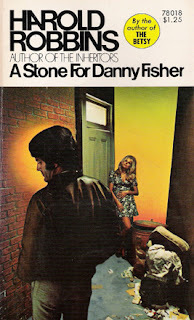 Elvis fourth movie "King Creole" is based on it and it's called "A Stone For Danny Fisher". The book was written in 1951 and it must have sold steadily through the years, because my edition is the 42nd printing, dated July 1973. And apparently the book is still in print. The yellowed pages tells the story of Danny struggling to be a boxer in New York, not a singer in New Orleans as was the case in Elvis version. I cheated and read the ending first, and it is not as happy as in "King Creole", where Danny continues his success. Instead he gets a stone in a cemetery, so to speak. But a little before that, he also becomes a father, if I understand it correctly. Guess I have to start from the beginning. And when I'm finished reading I have to find copies of "Flaming Lance" (pretty obvious which movie is based on that one) by Clair Huffaker and "Pioneer Go Home" by Richard Powell (the novel behind "Follow That Dream"). Sometimes Elvis or something related to him pops up when you least of all expect it. I mean, hearing an Elvis song on the radio isn't that big a surprise, reading about him on the internet is a daily occurrence and receiving a new Elvis record in the mail is a pleasant but not all that uncommon event nowadays because of the tempo that BMG, FTD and the bootleggers keep up. But this weekend, when I visited an army surplus store on the countryside together with my parents and my brother who was hunting for some baggy pants with many pockets, I wasn't counting on anything Elvis-like. Boy, was I in for a surprise. Because at the cash-counter, in a box, were some American military patches that servicemen wear on their uniforms. 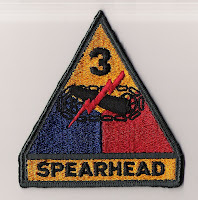 And one of them was a yellow, blue and red patch with a lightning bolt, a big number "3" and the text "Spearhead" that I immediately recognized. This patch is just like the one Elvis wore on his uniform, I explained to the lady at the counter. She didn't look too impressed, and obviously didn't understand what I was talking about. Anyway, I bought it for almost nothing, and at home verified my find. Yes, he wore it on his left sleeve, on his tour in Germany with the Third Armored "Spearhead" Division. And after getting out of the army he wore it again on his uniform in the movie "G.I Blues". Speaking of Elvis G.I Blues uniform, there was an interesting story about it earlier this year. Check it out, it's pretty amazing. So there you are. Elvis really is everywhere, even when you don't expect him to, and that never ceases to amaze me. The year is 1974. The time 2.30 a.m. My colleague is sitting with a friend watching a lounge show at The Las Vegas Hilton. A lounge show, he explained to me, is a show in a smaller showroom where you can sit and drink and watch an act. Anyway, this time they are watching Chuck Berry. Suddenly they hear something happening behind their backs, and turn around. There, two guards have suddenly materialised, and in walks Sammy Davis Jr together with Elvis Presley. And they have a couple of girls with them, too. Sammy Davis Jr and Elvis are then being lead to a booth at the front of the stage and sit down. At the same time, more and more people in the audience realise who are now with them. So does Chuck Berry who abruptly stops singing and playing. In that moment, Elvis waves at Chuck Berry, and Chuck Berry waves back. "Hello Elvis. Long time ago," says Chuck Berry and leaps into the familiar intro of "Memphis, Tennessee". This is a great little story I've never heard before, and I think it’s both fascinating and funny. I hope you do too. Sometimes, being an Elvis fans can lead you to some interesting experiences. A while back, a friend of mine started writing a novel, and asked me to read the manuscript with "Elvis-glasses" when he was nearly finished. The novel is called "Junk", and is about a rock guitarist who after fifteen years in the business is looking for new challenges. So, when opportunity knocks, he heads up north together with an old friend to play in a show about Elvis Presley. I took my task as technical advisor very seriously. I read the manuscript twice and gave my feedback: Elvis didn't rehearse much in 1976, he didn't smoke cigarettes but cigars, "See See Rider", "I Got A Woman"/"Amen" and "Love Me" is a typical start of a later Elvis concert, "Maybellene" is performed live at the Louisiana Hayride and yes, Elvis sang "Your Cheatin' Heart" too. Stuff like that. "Junk" was released just a week ago, and I was pleased to see that the author had listened to some of my "sound advice". It was also a boost to find my name listed under "Authors thanks to". I have just finished reading "Junk" once again, and I think it's a damn good book. And I'm proud to have played a small part in that. It’s always pleasant when people get interested in Elvis and you can, so to speak, help them along the way. That happened today at work, when a colleague and friend asked me if I had a DVD version of "The '68 Comeback Special" that she could borrow. She had watched "Elvis by the Presleys" on television and taken a fancy to our man dressed in black leather. Also, she was wild with him performing "If I Can Dream". I decided that the first disc of the 3-DVD set was enough for her. Even if she was interested I didn't think she was quite ready for the "Huh-huh-huh promo" and ten takes of "Big Boss Man". Not yet, anyway. Speaking of the special, I've always thought that BMG made a big mistake not releasing a CD box set with material from it, in the style of "The Las Vegas Years" or even "The Complete 50's Masters". Instead they released first "Memories - The '68 Comeback Special" and "Tiger Man", then "Burbank 68" on the FTD-label and finally, last year, "Let Yourself Go!" on the FTD-label as well. Such a shame! As a final note, here is an interesting piece of information. In the April/May issue of the Official Elvis Presley Fan Club magazine, there is an article titled "The other Side of the Story", where Alfred di Scipio, the Singer Sewing Executive for the TV-special, is interviewed. According to the article, it was di Scipio that convinced the Colonel that the special should not be a Christmas special, and not the producer of the show, Steve Binder. And Alfred di Scipio has the document to back it up. This is very interesting reading, indeed. Elvis Week 2007 is over, and that made me think of my trip to Memphis and Elvis Week two years ago, in 2005. For a whole week, I lived and breathed Elvis Presley. And so did a thousand others. It started at the airport where I suddenly found myself standing next to Priscillas parents waiting to grab my bags, and there was Jerry Schilling meeting them. And it continued on the way to my hotel where giant signs pointed out that "Elvis lives". When I passed through the doors to my hotel the first time, I could hear Elvis music playing from the bar. In the lobby, almost everyone I saw wore Elvis t-shirts and right before my eyes an Elvis impersonator passed by in his blue jumpsuit. And as if that wasn’t enough, there to the right, at a small table, Elvis buddy Sonny West was sitting signing autographs. The next day, hearing Elvis singing "Welcome To My World" in my headphones on the short trip up to Graceland, sent shivers up my spine. I'm finally here, I remember thinking. Graceland aside, I think the best thing was seeing and meeting musicians who played for Elvis. The highlight for me was a concert at Beale Street with the American Sound Studio band, playing Elvis songs from those fantastic sessions of '69. I even had the pleasure of interviewing organist Bobby Emmons and pianist Bobby Wood, and they were very humble and willing to share some of the moments they've had with Elvis. When I shook their hands, I couldn't help but thinking that I was just one handshake away from Elvis. The international impersonator contest in Memphis hosted by Elvis Presley Enterprises is over. A guy named Shawn Klush won the title "Ultimate Elvis tribute artist". Apparently, to EPE "tribute artists" have a better ring to it than "impersonators". I have never particularly liked impersonators. To me they are the fat guys in poorly made jumpsuits that after Elvis death helped cement the image of Elvis as a fat fool in too tight outfits. It's interesting to read what Elvis himself (or his secretary or whatever) thought of impersonators. Do develop your own special talents, he writes in a letter to a happy winner of a contest somewhere. I didn't think EPE liked impersonators either, but I guess it's money talking. EPE has even released a Elvis karaoke DVD set this summer. But on the other hand, who am I to judge. Two years back, when I was in Memphis, I recorded "Walk A Mile In My Shoes" to a karaoke track at Sun records, and I admit that I didn't try to sound like the Beatles! Watched the new Lisa Marie and Elvis duet of "In The Ghetto" for the first time. Have to admit I wasn’t overly impressed. Liked her first attempt on "Don’t Cry Daddy" more. In that one, father and daughter interacted in a more obvious way by being on the screen at the same time and the message, although sentimental there as well, worked better. By the way, there’s a lot of guns lying around in the new duet, any chance some of them belonged to Elvis?! Another posthumous duet is the one between Elvis and Celine Dion singing "If I Can Dream" on American Idol a few months ago. Not to bad, but listening to Celine always makes me think of the Titanic. Speaking of duets, I remember when I bought "The Lady Loves Me" when it was released back in 1983 as a single. Hearing Ann Margret singing that she would rather dine with Frankenstein than with Elvis was kind of funny, but I always preferred the other side of the single which was "I Can Help". So maybe Elvis-duets aren’t the thing for me. "There Is Nothing Like A Song" with Elvis and Nancy Sinatra definitely isn’t one of my favourites either. But there is always an exception to the rule, I guess. When Elvis sighs at the end of the duet version of "Today, Tomorrow And Forever" with Ann Margret, I don’t think the reason is the quality of the song but the woman standing next to him. What better day than today to start my own Elvisblog, something I’ve been thinking about doing for some time now. This morning, I was interviewed on national radio about why Elvis continues to fascinate and attract people. After a moments thought it dawned on me that the answer really was quite simple and obvious - the man is so damn good. He sings all kinds; rock, blues, gospel, country, soul, even funk. The guy didn’t write his own songs and still he makes them his own. Then you got to have something. Of course, marketing by BMG and Elvis Presley Enterprises help him along, but marketing is nothing without a good product, right!? By the way, received my copy of the new "That’s The Way It Is" DVD and man was I disappointed. The picture and sound quality of the bonus material was way below standard. Nice watching Elvis eating hamburgers, though!